How do we know if we’ve even made a difference? The issue of impact measurement is very real, because what’s the point of us working so hard when we can’t even quantify to anyone what we have done? Sadly, I’m feeling incredibly depressed these days because my kids who will be taking PMR this year did not do very well in their trials. In fact, their results dropped SIGNIFICANTLY for their trials. Granted, the questions are more difficult, but that’s still no excuse for them to not do well. I’ve been thinking and rethinking this question of impact again and again. I promised myself and the kids that if we work hard enough, we will reach our target. Our target is 20 of the 32 students in that class will get A for PMR English. This is a super duper big goal because there had only been 4/5 As in English so far every year in the history of my school. So in terms of quantifiable data, I guess I have none whatsoever to show that I’ve been a useful contributing member of the school. My weak kids are still weak, my good kids are still not great. I can literally feel the scalding of the judging look in every teacher’s eyes in the school. But today, my hope in myself is somewhat renewed. I know I’ve achieved little to nothing in terms of quantifiable results, but I’d like to think that some of the impact I’ve made that can hardly be quantified are what’s most important. These are things that I cannot put in charts and graphs to show how much progress my kids have shown, or things that I cannot sell in my interview with future employers. But essentially, these are things that keep me going on painful days, and things I will remember forever when reminiscing my days as a teacher. One of the values that I really want my kids to internalize is the importance of having big dreams. When I first met my kids, they can never articulate what their dreams are to me. To them, getting 8As in PMR is important because..well..it’s just good to get a lot of As. They can’t tell me why the As is a ticket out for them, or why the pursuit of knowledge in itself is incredibly valuable. 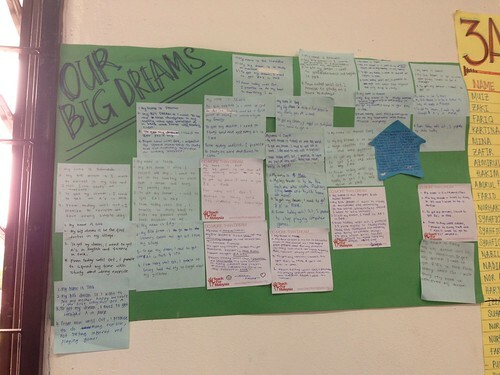 After the poor exam results, I got them to write about their big dreams again and to write why getting this A is important in achieving their dreams. Most of them could articulate very easily what their big dreams are, and I’m glad they’ve been quite specific as opposed to just writing “I want to find a good job” or “I want to be a doctor”. The best part are these notes. This kid is super amazing. 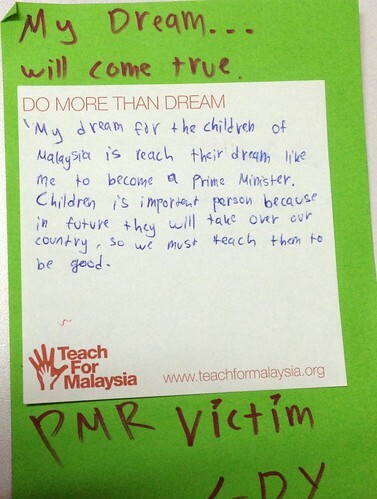 Notice that he wrote at the bottom: PMR Victim, Edy (his name). HAHA! Can’t believe she still remembers the video I showed them after coming back from India! This is my absolute favourite. My job is done here! After realizing that it’s very incredibly difficult to see huge progress in their exam results, mainly due to me being an inexperienced teacher and the circumstances, I’m so glad that they’ve taken something from me in my two years teaching them. 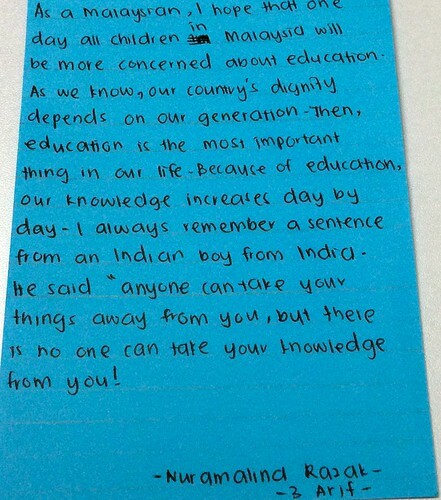 I hope they never ever forget the value of education and will continuously pursue knowledge when I’m no longer there. 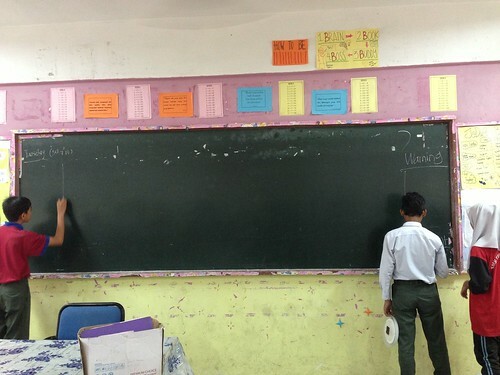 Kids preparing the board for me even before I came into class. The standard stuff Teacher Suet Li always writes: Day and date, agenda of the day, WARNING board, and kids who are absent. I never ever ever ever never ever would have imagined this sight in a million years (yes I’m being dramatic). Most of you would probably recognize this girl as Jaya, the girl who cannot even read one-syllable words (“the”, “she”) in the beginning of last year.Since we’ve started on the Sponsor A Child To Read program, she’s been coming to the reading sessions every week without fail. Last week, she asked if she could bring her siblings along. I thought she’d only bring her sister along, but she brought her ENTIRE family. Two brothers (13, 18) and two sisters (15, 8 ). And guess what? All of them can’t read (English) as well. 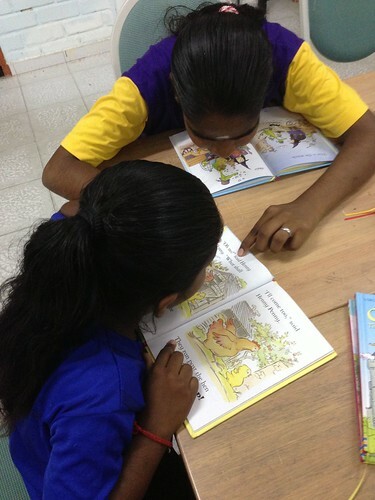 But here she is, patiently teaching her 8 year-old sister how to read one of the books donated by you guys. She herself probably could only read a third of the words in the book, but the confidence in her voice was remarkable. I still can’t believe that happened and I really really REALLY hope that even if the books may not be able to change Jaya’s literacy level right now, it will help change her sister’s. 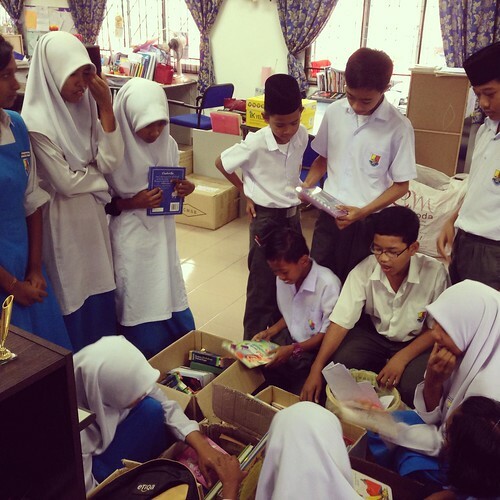 Before the holidays, tons of kids came over to get books from my mini library! THIS SIGHT MADE ME CRY TEARS OF JOY!!!! 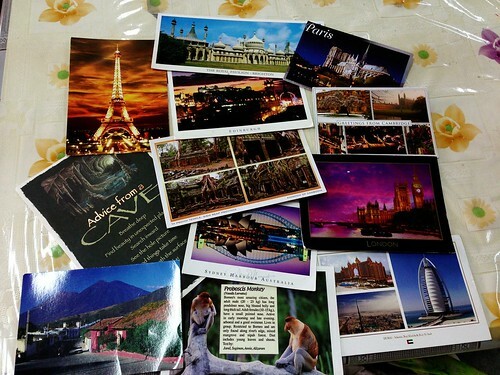 Postcards from all over the world 🙂 Keep them coming guys! My kids love reading about different parts of the world and your short inspiring stories! Unrelated to teaching but I went rock climbing for the first time during the holidays! It was a lot more challenging than I’d imagined it to be but so much fun! That’s all for today’s (or this month’s, haha) update. I have tons of other stuff to write about but shall pace myself so I have more materials to blog more often. p.s: I already got a job for next year! Will not be talking about it too much for now but yays!